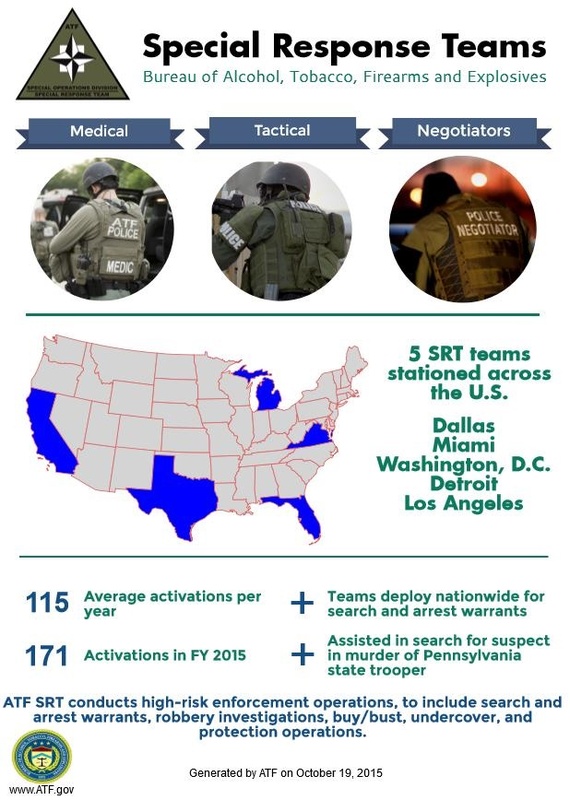 The SRTs are made up of three components; medical, tactical and negotiators. There are 5 SRT teams stationed across the United States. There are an average of 115 activations per year and teams deploy nationwide for search and arrest warrants. There were 171 activations in Fiscal year (FY) 2015 and they assisted in the search for suspects in the murder of a Pennsylvania state trooper. ATF SRTs conduct high risk enforcement operations, to include search and arrest warrants, robbery investigations, buy/bust, undercover and provide protection operations.